Welcome to the Month of Glory 172! What are the Ridvan Baha’i Elections? This month’s featured prayer is a video, called “Electing the Members of the Local Spiritual Assembly”. It’s absolutely beautiful and I recommend you show it prior to and during the voting! This month we feature a short 4.5 minute video, where Rúhíyyih Khánum Recounts Her Story of the Election of the First Universal House of Justice! A truly unique moment in Baha’i history! 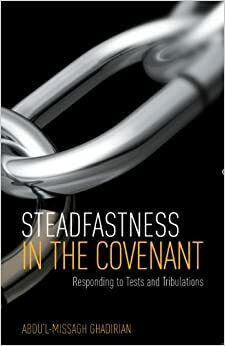 Steadfastness In The Covenant: Responding to Tests and Tribulations was written by Dr Abdul-Missagh Ghadirian, a psychiatrist who served the Institution of the Learned for nearly 30 years in different capacities including many years as a member of the Continental Board of Counsellors in the Americas. In this book, dedicated to the Bahá’í community of Iran, Dr Ghadirian show how the accelerated crises in the world, with their associated suffering and confusion, herald the advent of a transformation in the consciousness of people and their receptivity (positive or negative) to the teachings of the Bahá’í Faith. The Bahá’í Writings tell us that persecution and trials will occur and intensify as the Cause emerges from obscurity to full recognition. There are 3 main themes running throughout this book: what the Covenant means to the present generation of young Bahá’ís; scholarship and the Covenant and the life of Abdul-Bahá as the Perfect Exemplar and the Centre of the Covenant of the Bahá’í Faith. Hugh has taught his Korason Method of Authentic Voice and Dialogue (KM) on 4 continents with such diverse groups as NGOs in Egypt, an AA group in Nicaragua, engineers in Brazil and Inuit women in Nunavut. He has won scholarships and grants to study vocalization techniques in Mongolia and flamenco in Spain. Currently he is preparing to return to Europe to teach Hakomi and KM in Spain and Germany. Hugh has also built successful sales networks with hundreds of distributors in Canada, the U.S. and Mexico for the marketing of dynamic health products. Prayer Beads – Each with a Story! This website carries many products including jewelry, greeting cards, bookmarks, illuminations, wall hangings and more. William Sears, Hand of the Cause of God. For his work with children the glass figures reflect an innocence happy free spirit – the 19 beads represent marbles. Tahireh’s Legacy: The set of 19 black beads symbolize the veil that Tahirih removed from her chador and the ‘spiritual veils’ that must be eliminated in our pursuit of nearness to God. The Terraces: The natural mottling of the stone beads represent the terraces and their landscaping; the buildings on the arc and the panoramic views of the blue sky and sea. The Martyrs: The lined deep red seed beads represent the veins of the mortal body and the spots in the Poppy Jasper symbolize the blood shed by these dear souls. Although we may not experience physical martyrdom, these martyrs stand to remind us how important it is to consecrate our lives to service in the Cause. The Nightingale: The nightingale is a very plain little bird (its colors are brown and cream), but is known for its wonderfully sweet evening song. In the Bahá’í Writings the nightingale symbolizes the Manifestation of God, particularly Bahá’u’lláh. Primal Mirrors: The Unity of God’s Messengers inspired this very special set (this is the picture we see here). Large rounded onyx disks carry etched symbols of 8 revealed religions, while nineteen banded sentimentary stones echo humanity’s gradual progress over eons, aided by these Messengers. Refresh and Gladden: based on everyone’s favourite prayer “O God! Refresh and gladden my spirit . . .” Made from the finest glass. Coral and Pearls: This pair of prayer beads was created, one for the husband and one for the wife. The duel design respects the individuality of each person yet honors their union and confirmed faith in the covenant of Baha’u’llah. Thanks for the encouragement and support, Simin and Jeannie! You’ve got good eyes, Farah! You’re absolutely right! We’re starting 172 BE! I remember changing the newsletter template and grateful I’d remembered, but it looks like I forgot to save it! It’s time for me to get a secretary! Every adult Bahá’í is eligible for election to local and national administrative bodies responsible for decision in the conduct of Bahá’í affairs. Whether we’re voting at the unit convention; the Assemblies; or the Baha’i Council – the principles and requirements are the same. the distortion in public perception of the candidates by the bias expressed in the media. a growing sense of despair of the unlikelihood that the most capable citizens will emerge to deal with the manifold problems of a defective social order. The electoral system given to us by Baha’u’llah is without precedent in human history and Baha’is everywhere are giving greater attention to strengthening the process by which we elect our local and national assemblies and Baha’i Councils. In order to do this we must become active and well-informed members of the Baha’i community in which we live. discuss the requirements and qualifications for such a membership without reference however indirect, to particular individuals. we participate in the elections. When we wholehearted embrace the Baha’i electoral process in this way, we will witness a greater contrast between the emerging institutions of the Baha’i Administrative Order and the decaying social order around us. Personally, I find that thrilling! When we vote, we must vote for the 9 people who are best suited to serve. Even if we have a low opinion of all those who are eligible, it is still our duty is to vote for those nine from among them who, in our estimation, best meet the standards for service on a Spiritual Assembly. Those who do not wish to vote for nine, may achieve his end by purposely including the names of those who are ineligible, but this would be a betrayal of the trust placed in him as a Bahá’í voter. On 4 August 2016 the Universal House of Justice sent a message to all National Spiritual Assemblies, about organizing unit conventions. You can read the letter here. How has this helped you understand how to carry out your sacred responsibility? Post your comments below! It’s election season again, which always generates both discussion and confusion about what Bahá’ís can and can’t do, so I thought I’d delve into the Bahá’í Writings to help find some answers. Why Would We Want to Get Involved in Politics? What is the Bahá’í standard? We can engage in public discourse on issues of general concern to society, based on Bahá’í principles such as global climate change, race unity, the advancement of women, global prosperity etc. Why Don’t We Get Involved? How has this helped you understand what we can and cannot do; and why? Post your comments below! Is it possible to have leadership with out a designated leader? If the traditional understandings of leadership point explicitly to the need for a specific and designated leader, can leadership avoid focusing on a leader and still be leadership? Do the leadership styles that have been mentioned above apply to the Baha’i concept of leadership? If so, how? How is leadership recognized as leadership? I told her that the Baha’i Faith doesn’t allow just “anyone to be a leader”! Although we don’t have clergy, we do have a highly refined administration (local and national Spiritual Assemblies), elected at the local and national levels every year, and at the international level (the Universal House of Justice) every five years. In our election process, there is no campaigning or electioneering. Instead the names of all Baha’is in good standing over the age of 21 appear on the ballot. In April of every year, all Baha’is over the age of 21 must vote for exactly 9 people who they feel will best lead the community for the coming year. Each voter has the absolute freedom to choose without being biased or influenced by agendas, ambitions, or platforms. The nine individuals who receive the highest number of votes form the Assembly for that year. Their job is to oversee a wide variety of activities which include the education of children and junior youth, devotional services, study classes, discussions, social events, the observance of holy days, marriages, divorces, and funeral services. They may also oversee ongoing small-scale educational, economic or environmental development projects, particularly at the National level. The National Spiritual Assemblies are charged with guiding and coordinating Bahá’í activities within a given country. Their tasks range from the initiation and administration of large-scale social and economic development projects to book publishing; from overseeing relations with their respective national governments to the coordination and collaboration with other religious groups and non-governmental organizations. Promote amity and concord amongst the Friends, efface every lingering trace of distrust, coolness, and estrangement from every heart, and secure in its stead an active and wholehearted co-operation for the service of the Cause. They must do their utmost to extend at all times the helping hand to the poor, the sick, the disabled, the orphan, the widow, irrespective of colour, caste, and creed. They must make an effort to maintain official, regular, and frequent correspondence with the various Bahá’í centres throughout the world, report to them their activities, and share the glad tidings they receive with all their fellow-workers in the Cause. They must encourage and stimulate by every means at their command, through subscription, reports and articles, the development of the various Bahá’í magazines. They must undertake the arrangement of the regular meetings of the Friends, the feasts, and the anniversaries, as well as the special gatherings designed to serve an promote the social, intellectual, and spiritual interests of their fellow-men. The Universal House of Justice is the supreme governing institution of the Baha’i Faith. It is a legislativeinstitution with the authority to supplement and apply the laws of Baha’u’llah, the founder of the Bahá’í Faith, and exercises a judicial function as the highest appellate institution in the Baha’i administration. While being empowered to legislate on matters, the Universal House of Justice has, since its inception, limited its exercise of this function. Instead it has generally provided guidance to Bahá’ís around the world through letters and messages. The books and documents published by the Universal House of Justice are considered authoritative and its legislative decisions are considered infallible to Bahá’ís. The provenance, the authority, the duties, the sphere of action of the Universal House of Justice all derive from the revealed Word of Bahá’u’lláh which, together with the interpretations and expositions of `Abdu’l-Bahá and of Shoghi Effendi … constitute the binding terms of reference of the Universal House of Justice and are its bedrock foundation. Individuals are also appointed at various levels to aid in the spread of the Faith and to protect the spiritual health of the Bahá’ís. They are called Counsellors, Auxiliary Board Members or Assistants to the Auxiliary Board and work closely with the Local and National Spiritual Assemblies. In the Baha’i Faith, individual members of all three levels of the administration have no power or authority on their own. Only when they are gathered together, meeting officially as an institution, are they considered to be divinely inspired. Should they be graciously aided to acquire these attributes, victory from the unseen Kingdom of Baha’ shall be vouchsafed to them…. The members thereof must take counsel together in such wise that no occasion for ill-feeling or discord may arise. This can be attained when every member expresseth with absolute freedom his own opinion and seteth forth his argument. If, after discussion, a decision be carried unanimously, well and good; but if; the Lord forbid, differences of opinion should arise, a majority of voices must prevail. The first condition is absolute love and harmony amongst the members of the Assembly. They must be wholly free from estrangement and must manifest in themselves the Unity of God, for they are the waves of one sea, the drops of one river, the stars of one heaven, the rays of one sun, the trees of one orchard, the flowers of one garden. Should harmony of thought and absolute unity be non-existent, that gathering shall be dispersed and that Assembly be brought to naught. The second condition: They must, when coming together, turn their faces to the Kingdom on High and ask aid from the Realm of Glory. They must then proceed with the utmost devotion, courtesy, dignity, care and moderation to express their views. They must in every matter search out the truth and not insist upon their own opinion, for stubbornness and persistence in one’s views will lead ultimately to discord and wrangling and the truth will remain hidden. The honoured members must with all freedom express their own thoughts and is in no wise permissible for one to belittle the thought of another, nay, he must with moderation set forth the truth, and should differences of opinion arise a majority of voices must prevail, and all must obey and submit to the majority. It’s not easy to implement, since most Baha’is have not grown up in the Faith, and are used to waiting for other leaders to tell them what to do. In the Baha’i Faith, service is seen as the highest station. Canada is going to the polls next week, to elect a new prime minister and the United States will soon be electing a president. Apathy is setting in on both sides of the border as many people are not planning to vote because they don’t think their vote will matter. We know, as Baha’is that the old world structures are crumbling, but what is more worrisome, is when people don’t vote in Baha’i elections either. This is the story of our Grandmothers and Great-grandmothers; who lived only 90 years ago. Remember, it was not until 1920 that women were granted the right to go to the polls and vote. The women were innocent and defenseless, but they were jailed nonetheless for picketing the White House, carrying signs asking for the vote. And by the end of the night, they were barely alive. Forty prison guards wielding clubs and their warden’s blessing went on a rampage against the 33 women wrongly convicted of ‘obstructing sidewalk traffic. They beat Lucy Burns, chained her hands to the cell bars above her head and left her hanging for the night, bleeding and gasping for air. They hurled Dora Lewis into a dark cell, smashed her head against an iron bed and knocked her out cold. Her cell mate, Alice Cosu, thought Lewis was dead and suffered a heart attack. Additional affidavits describe the guards grabbing, dragging, beating, choking, slamming, pinching, twisting and kicking the women. Thus unfolded the ‘Night of Terror’ on Nov. 15, 1917,when the warden at the Occoquan Workhouse in Virginia ordered his guards to teach a lesson to the suffragists imprisoned there because they dared to picket Woodrow Wilson’s White House for the right to vote. For weeks, the women’s only water came from an open pail. Their food–all of it colorless slop–was infested with worms. So, refresh my memory. Some women won’t vote this year because–why, exactly? We have carpool duties? We have to get to work? Our vote doesn’t matter? It’s raining? Last week, I went to a sparsely attended screening of HBO’s new movie ‘Iron Jawed Angels. http://www.hbo.com/films/ironjawedangels ‘ It is a graphic depiction of the battle these women waged so that I could pull the curtain at the polling booth and have my say. I am ashamed to say I needed the reminder.All these years later, voter registration is still my passion. But the actual act of voting had become less personal for me, more rote. Frankly, voting often felt more like an obligation than a privilege. Sometimes it was inconvenient. My friend Wendy, who is my age and studied women’s history, saw the HBO movie, too. When she stopped by my desk to talk about it, she looked angry. She was–with herself. ‘One thought kept coming back to me as I watched that movie,’ she said. ‘What would those women think of the way I use, or don’t use, my right to vote? All of us take it for granted now, not just younger women, but those of us who did seek to learn.’ The right to vote, she said, had become valuable to her ‘all over again.’HBO released the movie on video and DVD I wish all history, social studies and government teachers would include the movie in their curriculum. I want it shown anywhere else women gather. I realize this isn’t our usual idea of socializing, but we are not voting in the numbers that we should be, and I think a little shock therapy is in order. On a personal note: last year when I cast my vote, I was acutely aware that I was doing it for all of the women of my grandmother’s generation, who fought for my right to be there.